The All New 3 Series: Where Performance and Luxury blend with Modern styling. A new era of 3ers is dawning and with it an all new level of performance and luxury. Mating the latest technology, luxury, and performance in to a familiar award winning package, the new 3 is now available with a more tailored trim level to satisfy a wider variety of enthusiast. In addition to the standard trim level, the new BMW 3 Series Sedan can now also be specified with any of three equipment lines or an M Sport Package. Customers can therefore adapt the appearance of their car to their personal lifestyle and preferences – in their own way and with eye-catching results. The Sport Line, Luxury Line and Modern Line each emphasizes the different sides to the new BMW 3 Series Sedan’s character in their own individual way. The exclusive, carefully coordinated equipment features embrace both exterior design elements and the selection of materials and colors for each model. In terms of value, design coherence and expressiveness, the new BMW Lines go far beyond existing packages in the segment. First up is the Sport Line: With eye-catching exterior features in high-gloss black, this new line accentuates the dynamic appearance of the BMW 3 Series Sedan. Eight heavily contoured high-gloss black kidney grille slats in a chrome-colored surround give the front end of the car a particularly sporty and alert look. The black inserts in the front apron make the air intakes appear larger and lend extra emphasis to the muscular wheel arches. Bi-color, double-spoke design 18-inch light-alloy wheels provide the athletic looks to match. Meanwhile, high-gloss black painted exterior mirrors and the standard high-gloss black B-pillar and window trim add an extra sporting flavor to the flanks. A black trim strip on the lower crease underlines the width-enhancing effect of the rear styling, while the black chrome exhaust tips rounds off the exterior’s sporty appearance. The sporty and exclusive ambience of the interior is expressed by contrasting black and red accents. Red trim rings, red scales in the circular dials, red stitching on the sports steering wheel and a base trim strip in high-gloss black with coral red accent strips all underline the sporting ambience of the cockpit. The standard sports seats can be specified in a choice of two upholstery styles and three colors. 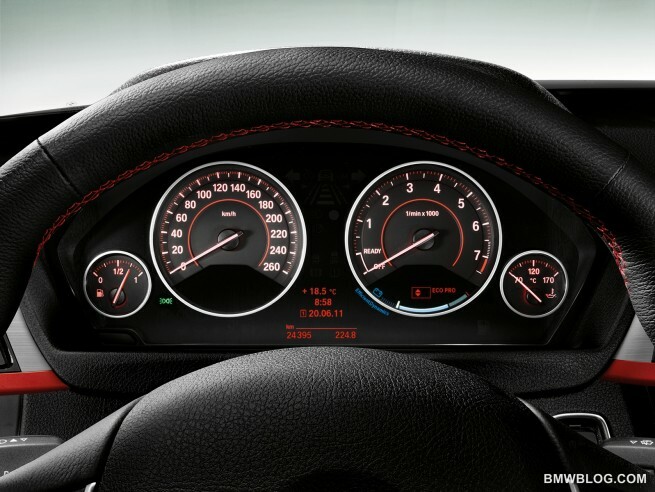 The ignition key for Sport Line versions of the new BMW 3 Series Sedan is identified by its black finish and red detailing. Luxury Line: The discreet high-gloss chrome elements of this line lend the exterior of the BMW 3 Series Sedan a particularly elegant and exclusive appeal. The BMW kidney grille with 11 fine chrome slats, two slightly offset chrome trim strips in the front apron air intakes, and a high-gloss chrome trim strip running horizontally above the air scoop give the front a striking appearance. As with the Sport Line, the B-pillar and window guide come in high-gloss black, and the window frame and weather strip are in chrome. Special 18-inch light-alloy wheels in multi-spoke design accentuate the stylishness of the new BMW 3 Series Sedan when viewed side-on. From the rear, the new Luxury Line is easily identified by its exquisite, high-gloss chrome trim strip – which extends across the full width of the rear apron – and its chrome exhaust tips. Chrome elements also catch the eye inside the Luxury Line variant. This is the only line which gives the radio and air conditioning units a chrome surround. 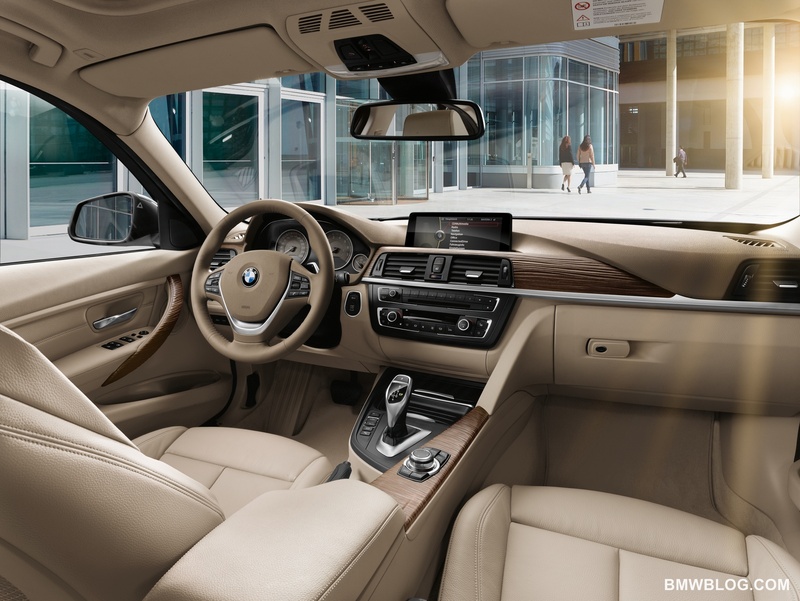 High-gloss wood trim (with stylish inlays also available) and seats with distinctive stitching and leather upholstery in three classically elegant colors highlight an inviting, exclusive ambience. The ignition key for Luxury Line versions of the new BMW 3 Series Sedan can be identified by its black finish and chrome detailing. Modern Line: In contrast to Luxury Line models, the avant-garde trim elements included in Modern Line versions of the new BMW 3 Series Sedan are all in satin aluminum, underlining the contemporary character of this line. The BMW kidney grille, with 11 satin aluminum slats, and double trim strips for the air intakes in the same color give the front end of the new BMW 3 Series Sedan a particularly contemporary, classy touch. The high-gloss black B-pillar and window trim of the Modern Line blend smoothly with the satin aluminum trim elements at the front and rear. 18-inch turbine-style light-alloy wheels strengthen the future-focused concept of this equipment line. The harmonious lightness of the interior dispenses with strong contrasts. Instead, with a light upper side to the dashboard and a steering wheel in dark oyster, it generates an all-new ambience. Leather upholstery in oyster or black, and a choice of three trim surfaces with accent strips in pearl-effect chrome, further enhance the appealing interplay between materials. A trim element with three-dimensional structure and open-pored wood lays on a whole new feast for the fingertips. Modern Line versions of the new BMW 3 Series Sedan are marked out by the oyster-colored ignition key with matt silver detailing. Looking for more sportiness than the Sport line? 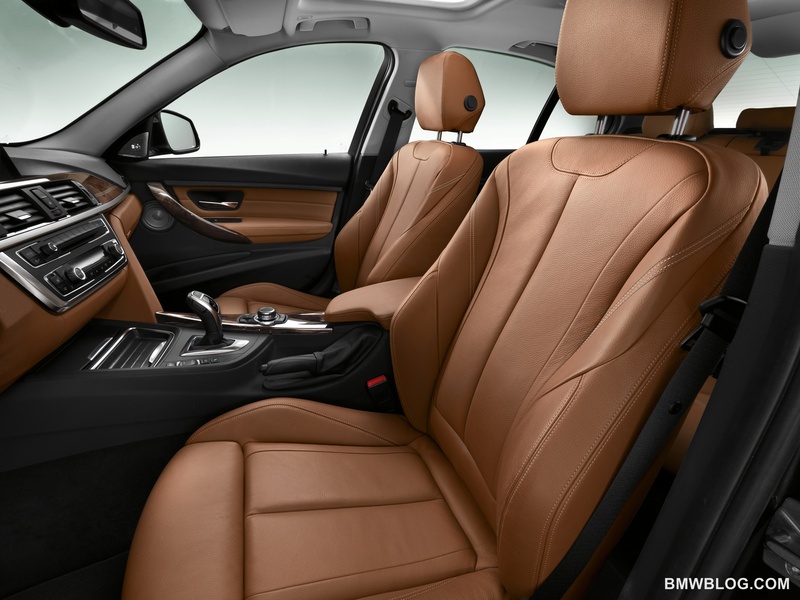 The M Sport Package brings the ultimate in sporting makeovers to the new BMW 3 Series. An all-new aerodynamic package for the exterior clearly sets cars specified with this package apart from the base model and the three lines. 18 and 19 -inch light-alloy wheels in hallmark M design, M Sport suspension, a black kidney grille and BMW Individual High-gloss Shadowline trim give the car that typical M look. The theme continues inside the car with sports seats boasting distinctive upholstery choices, trim elements with blue accent strips, an M Short-shifter (in models with manual gearbox), M door sill covers, an M driver’s footrest and the new M leather steering wheel. Whichever level of trim you’re looking for, BMW has engineered a package that’s right for a wide range of buyer. Whether you’re a mature buyer who appreciates fine leather and wood inlays, or the younger sportier buyer looking to dress your new 3 in the latest Motorsport styling, BMW has you covered.